Welcome to The Abso!ute Sound online! We explore music and the reproduction of music in the home. We believe that the sound of music, unamplified, occurring in a real space is a philosophic absolute against which we may judge the performance of devices designed to reproduce music. Our goal is to provide the resources consumers need to judge how a component's sound either honors or departs from the music's truth, and to make sound purchasing decisions that maximize their experience of reproduced sound. Below is our Issue 211, March 2011 table of contents and link to the editorial. 15 Future TAS: New products on the horizon. A little gem that delivers sound quality far above what its size and price would suggest. Steven Stone brings you the scoop. 22 Vincent Audio PHO-8 Phonostage: Neil Gader on a $400 phonostage that defies expectations. 26 High-Resolution Technologies Music Streamer Pro USB DAC: Robert Harley listens to a $500 DAC with an asynchronous USB input. 31 The 2011 Editors' Choice Awards: This is the big one! We pick the best gear at every price level in every product category. After auditioning this $995 multi-format disc player, Paul Seydor asks, "Why pay more?" Kirk Midtskog evaluates a horn-loaded loudspeaker from the company that's been building horn-loaded loudspeakers since 1946. This "package deal" from CRL will let you wire your entire audio system — and still have money left over for new music. Neil Gader brings you the good news. 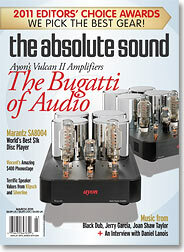 Jonathan Valin offers his opinion of the Technical Audio Devices CR1, first reviewed by Neil Gader in Issue 205. Sherri Lehman talks to influential musician and studio-meister Daniel Lanois about his new band and his technical and aesthetic preferences. Debuts from Black Dub and Frank Solivan; new releases from Sufjan Stevens and Joanne Shaw Taylor; reissues and rediscoveries from Jimi Hendrix, Percy Sledge, and Jerry Garcia; and a stellar follow-up to world-music blockbuster Buena Vista Social Club. The latest from Cecil Taylor, Joe Lovano, and Marcus Miller, plus four terrific new SACD reissues from Analogue Productions. Virtuoso renderings of Shostakovich on piano, Bernstein on clarinet, and Enesco on violin, along with popular orchestral showpieces by Ravel and little-known string quartets by Albrecht. Jeff Wilson selects the coolest jazz vibes of the 60s and 70s. Magnepan's Wendell Diller talks with Neil Gader.